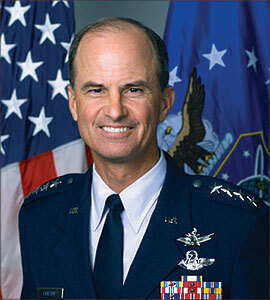 General Kevin P. Chilton is commander, Air Force Space Command, Peterson Air Force Base, Colo. He is responsible for the development, acquisition and operation of the Air Force’s space and missile systems. The general oversees a global network of satellite command and control, communications, missile warning and launch facilities and ensures the combat readiness of America’s intercontinental ballistic missile force. He leads more than 39,700 space professionals who provide combat forces and capabilities to North America Aerospace Defense Command and U.S. Strategic Command. General Chilton is a distinguished graduate of the U.S. Air Force Academy Class of 1976. A Guggenheim Fellow, he completed a Master of Science degree in mechanical engineering at Columbia University. He flew operational assignments in the RF-4C and F-15 and is a graduate of the U.S. Air Force Test Pilot School. General Chilton conducted weapons testing various models of the F-4 and F-15 prior to joining the National Aeronautics and Space Administration in 1987. At NASA he flew on three space shuttle missions and served as the Deputy Program Manager for Operations for the International Space Station Program. The general has served on the Air Force Space Command Staff, the Joint Staff, the Air Staff, and commanded the 9th Reconnaissance Wing. Prior to assuming his current position, he was Commander, 8th Air Force, and Joint Functional Component Commander for Space and Global Strike, U.S. Strategic Command. Q: What is the mission of Air Force Space Command and what is your job as commander? A: The mission of Air Force Space Command is to defend the United States through the control and exploitation of space. Our nearly 40,000 space professionals, stationed around the globe, are dedicated to that mission, providing our combatant commanders with an asymmetric advantage unprecedented in the history of warfare. As a major command commander, my primary job is to organize, train and equip our space professionals for success in their assigned duties and responsibilities. These duties include a wide range of activities. The men and women of 20th Air Force, under the expert leadership of Major General Tom Deppe, provide strategic deterrence via our nation’s Intercontinental Ballistic Missile force. Beginning with the Cuban Missile Crisis and continuing today, the Minuteman missile and those who operate, maintain and secure it serve as this nation’s last line of defense. 14th Air Force is the organization responsible for a wide array of space activities on nearly every continent. These stewards of space and their focused leader, Major General William Shelton, control all Air Force space assets. These assets provide communications, precision navigation and timing, weather forecasting, missile warning, space surveillance, spacelift and space control. In addition to operating Air Force space and missile systems, we also develop the next generation of systems through the Space and Missile System Center at Los Angeles Air Force Base, Calif. This is a unique responsibility and one of the ways we are different from Air Mobility or Air Combat Command. Lieutenant General Mike Hamel and his team are devoted to ensuring we stay at least one step ahead of any adversary. Finally, Colonel Larry Chodzko and his professionals at the Space Innovation and Development Center are our innovators. Day-to-day, they advance full-spectrum warfare through rapid innovation, integration, training, testing and experimentation. As you can see, Air Force Space Command is a diverse organization, making the job of organizing, training and equipping it all the more exciting. We realize our work is vital to our military, making us more combat effective and helping save lives every day. Q: What are your top priorities for AFSPC? A: When I assumed command in July 2006, I started out by communicating a clear vision. I had previously worked with many of the people within the command and knew their capabilities. I knew we had some of the best and brightest minds in the business. However, I wasn’t convinced we were universally recognized as the experts in space. Therefore, I spelled out a simple vision. We in Air Force Space Command are going to become the acknowledged experts and leaders in fielding, launching and employing space power for the 21st Century. This is not just my vision, it is our vision. We want every person with a question about space to know that Air Force Space Command is the place with the answer. With that vision providing our framework, we set out to codify strategic priorities. Today, my top focus in preserving and expanding our ability to deliver space effects to the joint fight is centered on space situational awareness. Having a clear understanding of the domain you operate in and who/what is in that domain is the first requirement of any commander, whether they are in charge of land, sea or air forces. For the space domain, it is the need to not only catalog but also understand what is up there, to understand when a satellite maneuvers, to understand when something is deployed off a satellite or a bus, and ultimately to be able to determine the capabilities of the satellite and the intent of the operator. Our next strategic priority is to provide safe and secure strategic deterrence. Make no mistake; there is a continuing need for strategic nuclear deterrence. The good news is we are currently modernizing nearly every component on the Minuteman III Intercontinental Ballistic Missile (ICBM). When we are complete, we will have virtually brand new missiles systems that we are confident will remain safe and reliable beyond 2025. AFSPC also defines the capabilities and systems to meet the future requirements of the combatant commanders. We are committed to developing, fielding and sustaining dominant space capabilities on time and on cost. Air Force Space Command’s Space and Missile Systems Center continues its back-to-basics approach to leverage existing and new organizational elements and practices. Under the guidance of the undersecretary of the Air Force, Dr. Ron Sega, we have implemented an incremental, block development approach to acquisitions, and this approach is already paying dividends. Of course, none of this is possible without the hard work and ceaseless dedication of the people in this command. We in Air Force Space Command are serious about attracting, developing and retaining people with the expertise necessary to meet the challenges of the future. We are working with partners throughout the Department of Defense and academia to develop the future leaders and experts this nation needs to meet the challenges of tomorrow. Q: Could you talk about the history of AFSPC and how it has evolved through the years? A: We can’t talk about the history of Air Force Space Command without first going back to the start of the space era following World War II. In the late ’40s, we had visionaries like Hap Arnold and Benny Schriever in the Air Force who felt our service should take the lead in developing space capabilities. They understood the keys to success would not only include big investments in science and technology, but also an equally large investment in human capital. Our roots can actually be traced back to Benny Schriever and his “Schoolhouse Gang” who literally stood up his organization in an abandoned schoolhouse in 1954 in Inglewood, Calif. He picked Southern California because it was a center of gravity for the engineering and technology expertise [that] fueled our nation’s rapid advancements in aeronautics in the 1950s. Later, the Schoolhouse Gang moved a short distance to El Segundo, and evolved into the Space and Missile Systems Organization [SAMSO] to what is today the Space and Missiles Center [SMC]. These pioneers, in short order, brought us the Atlas and Titan Intercontinental Ballistic Missile programs that also evolved into the mainstay of America’s access to space. These rockets not only carried our first satellites into orbit, but were the same rockets that propelled our Mercury and Gemini manned space flight programs in the 1960s. Just as significantly, these same pioneers executed the wildly successful Corona program, initiating space-based reconnaissance in a time when our nation desperately needed information about Soviet nuclear missile and bomber programs. I would say the manned space flight program and the race to the moon probably dominated the ’60s. I think we in the Air Force can be proud to know that John Glenn rode on an Atlas, and the Gemini program rode on the Titan. The Titan/Gemini program was the key technology demonstrator that enabled us to do orbital rendezvous, adjust orbits—all the things we really needed to be able to do in the Apollo program. The Air Force played an enormous role in that mission to win the race to the moon. It was truly a Cold War battle fought and won by the United States of America. In the 1970s, we started seeing satellite systems developed that we still rely on today. The DSCS program, the DSP program and early NAVSTAR work began in this decade. Additionally, Minuteman IIIs, still serving today, replaced our liquid fueled rockets in the missile field, providing our nation’s strategic deterrent. Nevertheless, something still wasn’t quite right in the way we were executing the space mission vis-à-vis the rest of the Air Force. I have to be careful here, because many people say the problem with the space mission in the Air Force at the time was that it wasn’t operational. I think that’s offensive to the people who were doing this kind of work starting back in the ’50s all the way through the ’60s and the ’70s. They were very operationally focused. They were focused on getting the job done; on getting the birds off the pad; getting capabilities into orbit and making sure those capabilities worked. But it is true that we were not organized in space the same way as the rest of the Air Force. So, in 1982, the Air Force established this great organization we call Air Force Space Command and normalized the way we executed the mission. I believe this has led to the incredible integration of space capabilities into the way we fight on land, sea and in the air today. Like any new organization, it takes time to mature and achieve its goals, so I would say the ’80s were a time of maturation for us. The early 1990s were a turning point because of a couple significant events. Desert Storm was our first opportunity to show the integration of air and space in a fight. General Chuck Horner was the commander of all air forces and, if you recall after that war, despite our tremendous success, he complained about the lack of air and space integration. Fortunately for us, the Air Force [saw] fit to make General Horner the Commander of Air Force Space Command. He started to bring air and space warriors closer together. The success of General Horner and subsequent commanders was clearly demonstrated both in the ’90s and in the conflicts that followed. When you look at our operations in Bosnia and in Kosovo, you see U2s flying over that theater sending signals intelligence and radar imagery through satellites back to people sitting on the ground at Beale Air Force Base who were then able to adjust collection in real time. This made it possible for us to begin to prosecute targets in minutes vice hours. It was the start of what we now call time sensitive targeting (TST). All of this was enabled by satellite communications and bandwidth transmissions we could not have imagined being fielded and utilized in 1991. With the development and employment of the GPS-guided JDAM [Joint Direct Attack Munition] weapon, we saw an even clearer demonstration of the fruits of General Horner’s vision. In the ’90s, Air Force Space Command matured into a warfighting-focused organization and, just as importantly, our Air Force matured its ability to integrate air and space capabilities. Another significant event happened in the early ’90s that still affects us today. We won the Cold War. Prior to that, there were two big powers in space—the Soviets and us. It had been that way since Sputnik and Explorer. We worried about what they might do to our capabilities in space and vice versa. We worried so much that we created a very large intelligence community dedicated to paying attention to Soviet space threats. We were collecting on their doctrine, policies and capabilities. In those days, they didn’t tell us when they were going to launch or what they were going to launch, so we paid very close attention and tried to discern the answers to these and many other questions. When the war ended, what happened? The threat went away. The Soviet infrastructure collapsed, and we appropriately shifted our focus as we downsized. One of the areas we took large reductions in was that focus on what was going on in the space domain, because for the time being, the threat had gone away. Now you roll the clock forward to this decade, this century, and what do we see? No longer are there just two countries with the capability to put things in orbit, there are eight that have or can orbit satellites. There are dozens of countries who own or operate satellites in orbit. In October 1957, there was one man-made object in space. Today, fourteen thousand objects are tracked by Air Force Space Command—some working satellites, some spent rocket bodies, some debris, some things we don’t know maybe exactly what they are. It’s a different landscape today. When you add the capabilities of other countries on top of our ever-growing dependence on our space capabilities to the way we fight [indeed, to our every day lives], you see the opportunity for a vulnerability to be exploited. We are at a time now, I would argue, a turning point in history, where we need to turn back the clock to the late 1980s and resurrect the intelligence focus that we had then on the space domain. It is not only a military issue. Stop and look at recent estimates of how big space is as a global business. It is estimated to be a nearly $200 billion enterprise. So there are other incentives to understand what is going on in the space domain and make sure, like the seas of the world, space remains an open and navigable environment for all peoples who would want to use it for peaceful reasons. So that is, in a nutshell, how I see the history and heritage of Air Force Space Command. It’s a privilege for all of us to build upon the legacy established by pioneers like Bennie Schriever and an awesome responsibility as well. Q: General, you mentioned during the change of command ceremony when you took over AFSPC that the command “is unique to every other major command.” Could you explain? A: The unique fact about AFSPC is that, with the exception of our two launch wings, every single operational unit of this command takes their daily orders from our nation’s Joint Forces Combatant Commander for Space. We are in the fight 24/7, 365 days a year. General Cartwright, the Commander of U.S. Strategic Command, is able to task our units, through a command chain that runs from the president of the United States through our numbered Air Force commanders to our wings and units deployed around the world. Our Total Force team, consisting of active duty, DoD civil servants, AF Reserve and Air National Guard ensure capabilities such as global communications, precision navigation and timing, weather forecasting, missile warning, strategic deterrence, space surveillance and space control, are available to the Department of Defense and many other users any time, and anywhere. This unique arrangement means we are always in the battle, meeting our nation’s needs whenever and wherever called upon. Q: What have been the biggest challenges to the success of AFSPC and how does the command plan to deal with these challenges moving forward? A: The very nature of warfare is changing at an amazing rate. Adversaries no longer mass forces and move troops and supplies in tight formations. The enemy of today is increasingly elusive, fleeting and widely dispersed. Individuals and non-state actors are gaining access to increasing amounts of power through the proliferation of technology and information. Our challenge is to maintain a continuing advantage during these times of great change, to meet this adversary head on, anticipating their next move and fielding capabilities that will provide combatant commanders with an asymmetric advantage. Our toughest task is developing next generation systems that meet the combatant commander’s requirements, on time and on budget. We are simultaneously modernizing every major system in our inventory—from satellite constellations, to missile warning and to our nation’s Intercontinental Ballistic Missile force. Fielding these types of capabilities while simultaneously prosecuting a global war is a daunting job. However, we fully realize failure is not an option. Q: Why is it important to improve situational awareness and command-and-control capabilities? A: Space capabilities are an integral part of national security and to our way of life. Our land, air and sea forces are dependent on space for navigation, intelligence, weather forecasting, communications and other services. Commercial space usage includes satellite TV, radio, cell phones, pagers, pay-at-the-pump gas stations, video-teleconferencing, satellite-aided search and rescue, mapping and imagery, and many more. With many nations owning or operating satellites on orbit, it is imperative we secure freedom of action in space for our nation and allies and that we protect our interests. That means transforming our capabilities from cataloging what is up there to making improvements in space situational awareness and command and control to give combatant commanders vital information, including the capabilities and owner’s intentions of any new object put into space. The integration and fusion of space capabilities [space intelligence, surveillance and space environmental monitoring] at the Joint Space Operations Center at Vandenberg AFB, Calif., will allow us to better protect and defend critical space assets and respond to new and emerging threats, whether hostile or environmental. Space situational awareness provides the foundation for the command and control [C2] of space assets. We must ensure we can protect America’s space resources and efficiently allocate them in support of theater commanders. We are developing enhanced command and control tools to synchronize space and air effects and improve support to joint/combined forces and national partners. For example, we are working hard to develop robust space C2 applications to enable the Joint Functional Component Commander for Space [JFCC Space] to more rapidly process and satisfy space support requests and enhance the space effects we deliver to combatant commanders. The tools in development will give the JFCC Space a more complete understanding of the space environment and permit continuous collaboration with joint, national and coalition partners. Q: Could you discuss the need for a long-range conventional strike and responsive space capability? A: Our long-range strike platform, also referred to as Conventional Strike Missile, is just one possible option to provide the president an immediate, conventional strike option. We are still examining the alternatives to determine just what capabilities can be brought to bear. However, the bottom line is we need an ability to strike fleeting targets, like a terrorist cell, more quickly and before they can escape or execute their own attack. Operationally Responsive Space (ORS) is a potentially important capability for the United States. While we continue to develop more traditional satellite constellations, we also have an eye on the future and smaller, more tactical, responsive spacecraft. Our goal is not to supplant our EELV operations. As technology improves, we aim to pursue the development of smaller satellites, opening up the possibility of smaller classes of boosters. The Minotaur program and Tactical Satellites are perfect examples of this. There are three key missions for responsive lift being discussed. First, use responsive operations in augmenting surveillance and reconnaissance platforms in response to the needs of a combatant commander. Second, responsive operations may have utility in replacing space assets that have been disabled by attack or natural phenomenon. This is not meant to imply a one-for-one replacement strategy. A quick launch replacement capability would only provide the most vital capabilities of the asset in question. These capabilities would be enough to meet combatant commander requirements until the launch of a fully capable replacement. Finally, responsive space holds promise to enhance space situational awareness. Q: You have previously spoken of AFSPC assets being an “invisible force.” Could you explain? A: People don’t see where our nation’s space capabilities and support come from because they are on orbit or underground in missile silos. As the “invisible force,” our assets and, more importantly, our phenomenal airmen provide the foundation for capabilities the combatant commander relies upon and, quite frankly, expects. In this, we cannot fail. Our goal is to continue providing an unparalleled asymmetric advantage to combatant commanders, ensuring success in their mission through these transparent but critical assets. Q: What can industry do to help AFSPC accomplish its mission? A: We want to be good stewards of the taxpayer’s money, and to do that we need industry’s help. This is really a partnership requiring each of us to be actively engaged. We must work together to develop the best concepts and systems required to meet the national security space needs of today and tomorrow. The cooperation of our industry partners is vital as we continue on the path to success, control costs and stay on schedule. We rely on industry’s management tools and best practices to identify, characterize and resolve program technical issues before they become larger, more costly issues. Government can make informed budgetary and programmatic decisions with accurate cost estimates from industry. Together, we preserve America’s asymmetric advantage through teamwork, cooperation and open dialogue. Q: Being a distinguished graduate of the U.S. Air Force Academy and a command astronaut pilot with more than 5,000 flight hours, how do you feel about the accomplishment of becoming the first astronaut to earn a fourth star? A: I am blessed to have the opportunity to lead a total force of nearly 40,000 people in Air Force Space Command, who are active duty, Guard, Reserve, civil service and contractor. Together, we deliver important space capabilities to our nation. I enjoy waking up every morning, knowing that our space professionals make a difference with the missions they execute for the Air Force. As we celebrate our Air Force’s 60th anniversary, we also celebrate our own silver anniversary. Coming into our 25th year, we recognize the milestones we’ve passed to get to this point. More importantly, we are excited about what the future holds for AFSPC and what space capabilities we can deliver for our nation. Q: What is the future of AFSPC and what role will it play in the development, acquisition and operation of the Air Force’s space and missile systems? A: The future of Air Force Space Command is bright. We have implemented a “back-to-basics” approach to our space acquisition programs that is already beginning to pay great dividends. We’ve made some tough choices and moved forward through several critical milestones. We’re also moving ahead to help revitalize the space industrial base and continue strong investments in science and technology. We have taken important steps to protect our space systems and secure the space domain. Space systems provide a decisive edge on the battlefield—and our adversaries have taken notice. Today’s space surveillance capabilities will evolve into integrated space situational awareness. Future space control activities will benefit from this improvement and go further to protect our national security space capabilities against known vulnerabilities and credible threats. Our priority is to provide space combat effects to the combatant commander. We must be able to do so despite any adversary’s attempt to deny free access and use of space. Ultimately, it is more than just satellites and missiles that enable us to be successful in the future. Even the most cutting-edge technology would be useless without trained, equipped and motivated space professionals. Every man and women assigned to this command is a “space professional” and we have made great strides in helping our people be better trained, better equipped and better organized to deliver the critical edge that only space can provide. We invest heavily in our people…and they will deliver our future. Joint warfighters, first responders, civil and commercial customers and the people of our nation are counting on us.